TANAKA | Maximize the advantages of the limited assets "Urban Mines"
Home > SOLUTIONS > TANAKA TECHNOLOGIES > Maximize the advantages of the limited assets "Urban Mines"
Precious metal mainly refers to gold (Au), silver (Ag), platinum (Pt), palladium (Pd), rhodium (Rh), iridium (Ir), ruthenium (Ru) and osmium (Os), 8 kinds of metal elements. These precious metals posses excellent performance and have been contributing greatly to the development of traditional industries. The precious metals have limited production therefore are very valuable. 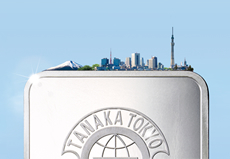 Here, by taking advantages of these limited precious metals, we would like to introduce the approach of TANAKA PRECIOUS METALS. Our company collects and recovers precious metal materials that were used everywhere (urban mines), and re-commercializes them aggressively. An introduction of computer recycling as an example. In 2001, by the enforcement of the "Law for Promotion of Effective Utilization of Resources", the collection and recycling of discarded computers from corporate customers (companies, leasing companies, government agencies, local governments, schools, hospitals, etc.) were obligated. After sending used PCs to the manufacturer, PCs are to be sorted out to CPU that richly contains precious metals, and then sent to our factory. Our factory utilizes appropriate treatments to extract out as many precious metals as possible, and return precious metals as bare metals and raw material resources. The gold amount in 60 pieces of CPU is same as the gold amount in 1 ton of gold ore. It is amazed to learn that there are so many resources around us, rather than looking for gold ore to produce gold in Japan.